Donato Battista first appears in the Painesville, Ohio, area in 1907. In America, Donato Battista was known as Tony Battista. Donato Battista, son of Pasquale Battista and Maria Angela Fortunata, was born on October 24, 1904, at Casalciprano, Italy. He married Bertha Honkala in 1925. Donato died on April 2, 1968, at his home, 486 Henry Street, Painesville, Lake County, Ohio, at age 63. His body was interred at St. Mary Cemetery at Painesville Township, Lake County, Ohio. Donato Battista, age 3, immigrated to the United States on November 24, 1907, travelling to 109 Storrs Street, Painesville, Lake County, Ohio, joining his father, Pasquale Battista. He was travelling with his mother, Maria Angela Fortunata, sister, Lucia, and brother, Nunzio. Donato was employed by the City of Painesville for 35 years. 1. Mary Jane Battista was born on July 1, 1926. She married Clarence John Ames, son of Paul H. Ames and Nellie May Foster, on August 21, 1948 at St. Mary Catholic Church, Painesville, Lake County, Ohio. 2. Helen Battista was born on September 2, 1931. Helen died on June 2, 1937, at home, 579 Storrs Street, Painesville, Lake County, Ohio, at age 5, of nephrititis. Her body was interred at St. Mary Cemetery at Painesville Township, Lake County, Ohio. 3. 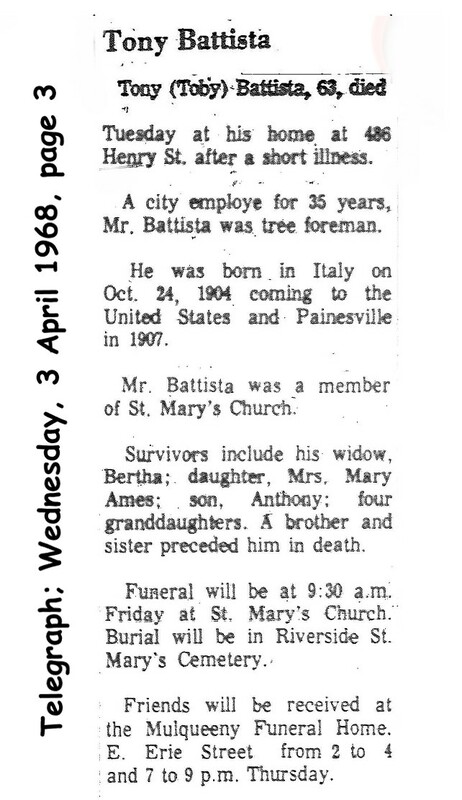 Anthony Pasquale Battista was born on September 15, 1935. He married Jeanine Marie Nielsen, daughter of Oscar Nielsen and Cecilia Bludau, on May 7, 1960 at St Mary Catholic Churdh, Painesville, Lake County, Ohio. He married second, Marlene Fleming, daughter of Harold H. Fleming and Theresa R. Lombardy, on October 5, 1985. Anthony died on January 28, 2014, at Hospice House of the Western Reserve, Cleveland, Cuyahoga County, Ohio. His body was interred at Riverside Cemetery at Painesville, Lake County, Ohio.